Dremel have launched a new range of router bits for the Dremel Trio, which means this little powerhouse tool is now even more versatile. I've mentioned before that I'm not a fan of a router. Yes, I know they can do lots, but give me a Dremel Trio and I'm happy. If I want to add a decorative edge, cut out a design or rout a groove or dado, it's easier to get out my Dremel Trio and pop in a router bit. 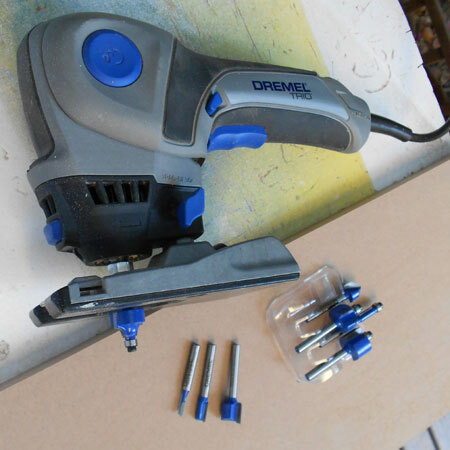 I am so glad that Dremel have now added to their range of router bits, and the new bits cut fast and last longer. The special carbide router bits are specially engineered to work with the Dremel TRIO and are supplied as a kit that includes a beading, a rabbet, a flush trim, a cove and a V-groove bit.